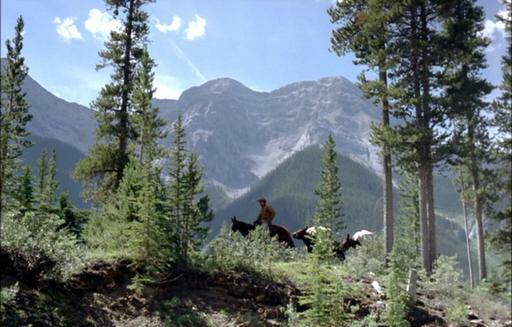 The Riding Ridge is on the west side of Hwy 742 near the northern end of Spray Valley Provincial Park, 9.4 km south of the Three Sisters Drive intersection in Canmore, and 26.1 km north of Mule Hill (Rummel Creek). Framing this image are several peaks of the Goat Range in the foothills of the Canadian Rockies, as well as some lovely Canadian fir trees. Remember this spot; you will see it again more than a decade later at a time when the men’s lives have become far more complicated than they are here amidst the joy of their Brokeback summer.